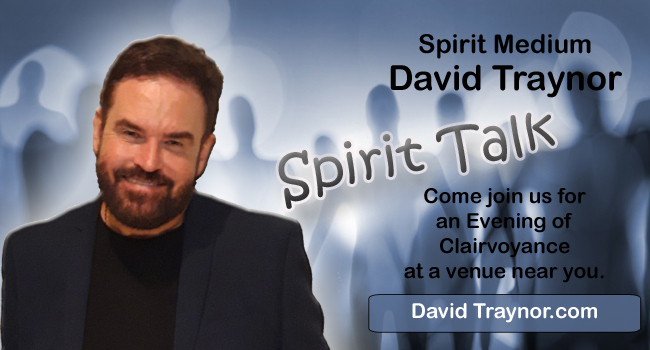 2019 Spirit Talk Tour with Spirit Medium David Traynor. Tickets £20.00 ONLINE ONLY click the "Buy Now" button below. One great price gets you choice of seat, the full show and Q&A with David. Please proceed to pay by clicking the Buy Now button below. PLEASE NOTE YOU DO NOT NEED A PAYPAL ACCOUNT to use this and can pay by CREDIT or DEBIT card. NO PAYMENT FEES are added. You can also pay on the door on the night subject to availability. Your Tickets are NOT POSTED to you. They can be collected on the night using the name you submitted when you booked them. If you use a PayPal account remember this could be a business name or your maiden name if you haven't updated the account. The email you will receive from PayPal is your proof of purchase and receipt. You may choose to bring a copy of this with you but be assured we are provided with a list of all the bookings. If you have attended any of David's demonstrations, family galleries or had a Private Reading we would love to hear your comments of the experience via the Guestbook. If you would like to be in touch with like-minded people and share knowledge and spirituality then participate in the Discussion Forum. Thank you!